While we see beautiful colours, lovely set designs and candid moments in the trailers and video clips of OK Kanmani, it was a similar scene at the Taj Coromandel, Chennai today (April 11th). 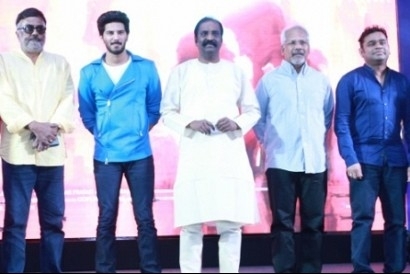 Tamil patriot lyricist Vairamuthu, evergreen Mani Ratnam, music Mozart AR Rahman, smart and dashing Dulquer Salmaan and camera king PC Sreeram graced this event where OK Kanmani team thanked everyone for its successful soundtracks. "AR Rahman and Mani Ratnam sat together and wrote the song Mental Manadhil. Many people asked me why I didn't write, that's because I was out of town and amdist the gap these two made it as lyricists. The lesson I learnt was to never leave the city while working in a film". On that note, the whole media burst out of laughter. This most sought after actor felt this was a dream-come-true project. He said, ''This entire one year feels like a dream. A dream that I don't want to wake up from. A dream that I want to keep living. This is a dream team; working with people like PC Sreeram, Mani Ratnam and AR Rahman is magical. I am actually sad that the film is going to release as I have to wake up from my dream''. ''I want to thank each and everyone who worked for the film. When I approached Leela Samson, I was very skeptical if she would do it or not. But I got such a positive response from her and I can't be happier than this with her performance. Ramya is also a part of our team and it has been a pleasure working with everyone''. With that, the event came to an end and the rest will be known on the release day April 17th. This page has information about OK Kanmani team met the media for rendering their thanks for a positive response for its audio tracks.